The Chart House in Dana Point (photo by Benjamin Ginsberg). Sixty percent of new restaurants close or change ownership within the first year, according to a recent study by Ohio State University; only one in five survives beyond five years. Given the sheer quantity of restaurants that open in Orange County each year, the odds of thriving for 40 years or more seem astronomic. Competition would seem particularly fierce among those serving coastal cuisine in a county known for its picturesque coast. Location is key to survival. The Cannery and Woody’s Wharf are on the water in Newport Beach and offer docks for those arriving by boat, fairly common thanks to electric boat rentals. Las Brisas in Laguna Beach and the Chart House in Dana Point are on cliffs high above the water, offering sweeping views of the coast. 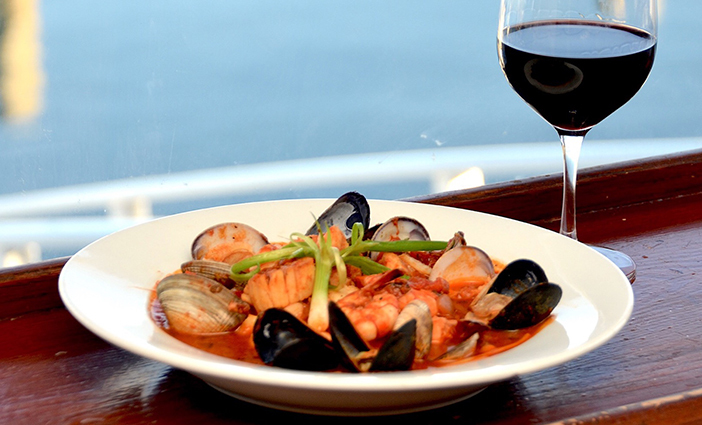 Other elements contributing to their longevity include restaurant design, service and, of course, the seafood itself. Let’s chart a course from south to north. Buzzy Bent, Chart House co-founder with famed Hawaiian surfer Joey Cabell, favored organic architecture. Bent retained San Diego architect Kendrick Bangs Kellogg, who had been inspired by the work of Frank Lloyd Wright, to design half a dozen of the restaurant’s locations. 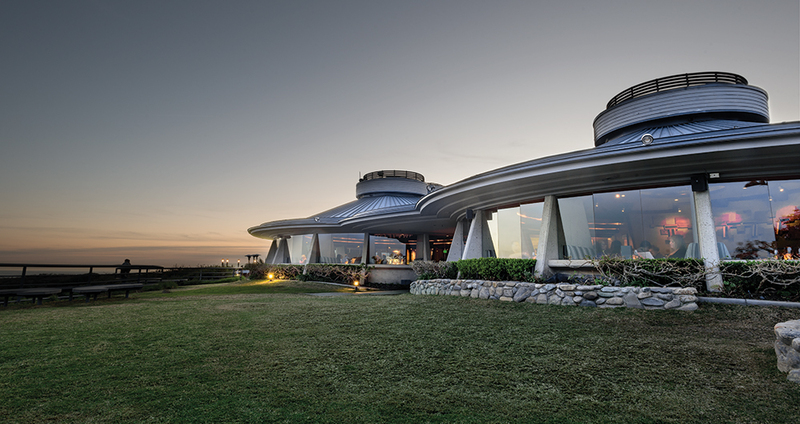 Chart House Dana Point, which marks its 40th anniversary next year, consists of three circular pods atop a bluff. The architecture alone makes any visit a special occasion. On a clear day, the view of the coast and azure Pacific extends 50 miles; in the spring, you can spot migrating gray whales. Bunnies frolic on the lawn; the moon rises over Dana Point Harbor. The site is popular for weddings; pop the question at table 204, 205 or 206. Circular stairs lead from a street-level “crow’s nest” down to the restaurant. Decor inside includes a massive modern chandelier. The shrimp, crab, avocado and mango stack is both lively and delicate, with significant morsels of seafood. The sherry-laden lobster bisque is a standout, the salad bar expansive. Wicked Tuna presents ahi three ways—as tartare, on wonton-shell tacos and pepper-seared—with a mound of plantains. Globally inspired seafood entrées include crispy wok-fried whole fish and swordfish and spaetzle. Hard to resist are the Alaskan King crab legs, sweet and served with drawn butter and a loaded baked potato. Specials such as lobster habanero mezzaluna are first tested on the reality TV show Billion Dollar Buyer; its star is Tilman Fertitta, CEO/owner of Landry’s, Inc., whose massive restaurant portfolio includes the Chart House chain. Hot Lava Chocolate Cake with Godiva chocolate liqueur is the signature dessert. But dreamily unctuous housemade ice creams—in flavors such as peanut butter chocolate swirl—may be even more memorable. Bisque and calamari at Las Brisas in Laguna Beach. 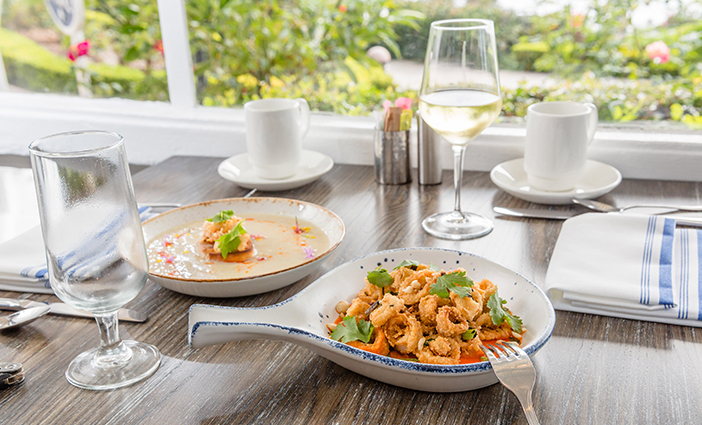 The same year Chart House opened, 1979, the Victor Hugo Inn, which had opened in 1938, was rechristened Las Brisas and changed its focus to Mexican West Coast cuisine—Californian and Mexican treatments of local seafood. 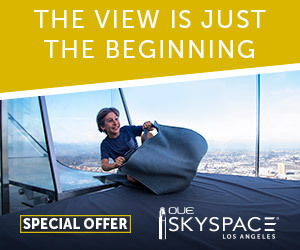 The restaurant is on a point overlooking Heisler Park and has one of the most iconic views of the Laguna Beach coastline. Resort-like Las Brisas has a new Seaside Cantina with a 65-foot Koa-wood bar inlaid with mother-of-pearl. Consider the Casa Mesquite Orange Margarita, with Casamigos Reposado and a mesquite-grilled orange, or the very-special-occasion Top of the World ($60): Patrón Platinum and Grand Marnier Cuvée du Centenaire served in a locally handcrafted glass rimmed with red alaea salt. Cantina menu highlights include a pomegranate goat cheese taco and two versions of oysters, one on the half shell with Meyer lemon chimichurri, another with charred corn, roasted poblano peppers, mascarpone, chorizo and toasted panko. Make that three types of oysters: Chicken “oysters” come with crispy chicken skin and charred tomato jam. The popular patio offers its own menu, too, with three versions of tacos—ahi tuna, filet mignon and bacon, and citrus-marinated chicken—all incorporating jalapeño tater tots. Enjoy them around the colorful tile firepit. Among the dining room’s best ideas is the lunch trio: Choose three of nine items, such as cauliflower two ways, tempura’d and puréed with black garlic and chile oil; crispy sweetbreads with plum chutney and sunflower seeds; and crab cake with poblano, chile vinaigrette, apple slaw and fennel pollen. Stars at dinner include a mixed seafood grill of charred octopus, shrimp, lobster, snow crab claws, fresh catch and new potatoes. Upon request, the restaurant will convert the festive surf and turf enchilada to a surf and surf, two rock lobster enchiladas with charred tomatillo sauce. Finish with coconut flan. 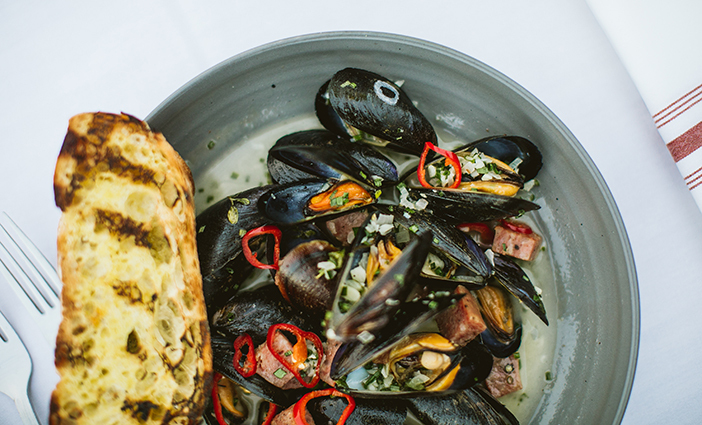 PEI mussels with soppresata at the Cannery Newport Beach. Of the seafood restaurants that opened in Newport Beach in the 1970s, The Cannery Newport Beach has the most fascinating history. The area’s first commercial fish cannery was built on Newport Harbor’s Rhine Channel in 1921. Western Canners Co. took over the plant in 1934. When it closed in 1966, local businessmen envisioned a Montmartre by the sea, small shops and restaurants attracting both artists and visitors. Bill Hamilton reopened the plant as a restaurant in 1973, operating it for more than a quarter of a century, until 1999. Local resident Jack Croul bought it in 2000 and entrusted it to restaurateur Ron Salisbury, whose family founded El Cholo eateries in 1923. The Orange County Register deemed the Cannery one of the county’s 10 best places to eat in 2106 and noted its lobster carbonara. CBS Los Angeles featured its luxe lobster rolls, whole Maine lobster and preserved lemon butter on a top-loaded brioche bun with Old Bay seasoned chips. Take the stairs to the Jellyfish Lounge; be sure to look up at the whimsical jellyfish sculptures hanging from the ceiling as you ascend. The 911 roll—shrimp tempura, spicy tuna, yellowtail, cucumber, jalapeños and chili oil—is a local favorite; an off-menu salmon-belly roll is superb. Also available are no-rice rolls. In the dining room downstairs, consider grilled octopus with aji-amarillo coconut sauce, pears, cucumber, pomegranates and pickled green papaya; loup de mer with charred broccolini, crispy fingerlings and bagna cauda; and the Balboa Sundae with caramelized bananas, vanilla ice cream, Heath Bar Crunch, mixed berries and more. Cioppino at Woody’s Wharf in Newport Beach. A couple of Newport Beach seafood restaurants predate the Cannery. One, the quirky Crab Cooker, dating to 1951, is closed for structural repairs. The other, Woody’s Wharf, opened in 1965 and, as general manager Ralph Nudo quips, “She just won’t go away.” Nudo is one of four partners who grew up together in Whittier and have been friends for 30 years. Celebrities such as John Wayne, Cary Grant and Humphrey Bogart and sports legends Mickey Mantle and Billy Martin have dined at Woody’s. Past owner actor/karate champion Chuck Norris hired his martial-arts students to work at the restaurant: Doormen included Jean-Claude Van Damme. Woody Payne originally stored and repaired fishing-fleet boats at the site, then he opened a watering hole where his fellow fishermen could gather. Its unpretentiousness and fierce local following remain hallmarks. “Woody’s Famous” New England clam chowder, in a cup, bowl or bread bowl, deserves its moniker. It brims with clams, hand-torn potatoes and vegetables. Also on the menu: spicy bang bang shrimp, generous fish and chips—and ooh, butter cake! Other draws include regularly scheduled live music and deejays, an occasional magician and, always, eye-level harbor views.